About 6,000 homes, farms and businesses remain without power, energy chiefs have said. While the vast amount are still dealing with the impact of ex-hurricane Ophelia, ESB Networks said some of those cut off were affected by Storm Brian. The worst areas for the blackouts are parts of Cork and Wexford. 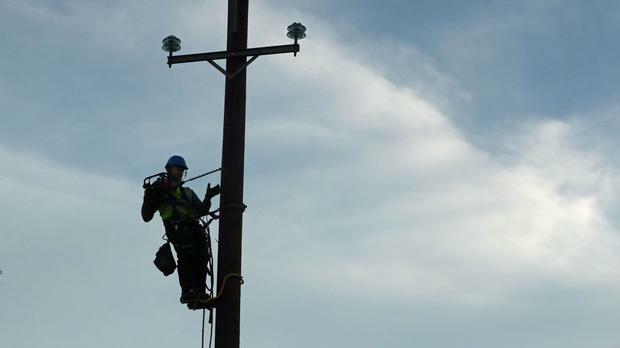 "ESB Networks is acutely aware of the tremendous difficulties and frustrations of communities in areas that remain without power," the company said. "We sincerely apologise to those affected and we ask the public to reach out to those in their communities that are without supply." There was some localised flooding following Storm Brian but there was only limited damage from the Atlantic weather system. The Blackwater burst its banks in north Cork but there was only minor impact in both Mallow and Fermoy. A combination of high tides, the storm winds and high water in the Shannon caused flooding in Limerick with some homes, businesses and public offices affected. Flood defences held back most of the high tide at the Spanish Arch in Galway.